The first stage in management of the cancer is to obtain a small tissue sample by carrying out a biopsy. Often, this can be carried out under local anaesthetic however, some cancers may require examination under general anaesthesia due to their location. Once the diagnosis has been made and the extent of the locoregional disease has been understood the cancer will be staged using the tumour, node, metastases (TNM) staging system of the American Joint Committee on Cancer1-5. Therefore small but deeply invasive tumours have now been upstaged. If the cancer is confined to local structures only this represents stage I or II disease. If the cancer involves deeper structures and/or has spread to involve lymph nodes, this would constitute stage III or IV disease. AJCC Cancer Staging Manual – 8th Edition. Kuk SK, Yoon HJ, Hong SD, Hong SP, Lee JI. Staging significance of bone invasion in small-sized (4cm or less) oral squamous cell carcinoma as defined by the American Joint Committee on Cancer. Oral Oncol 2016; 55:31-36. Ebrahimi A, Gil Z, Amit M, et al. Primary tumor staging for oral cancer and a proposed modification incorporating depth of invasion: an international multicenter retrospective study. JAMA Otolaryngol Head Neck Surg 2014; 140:1138-1148. 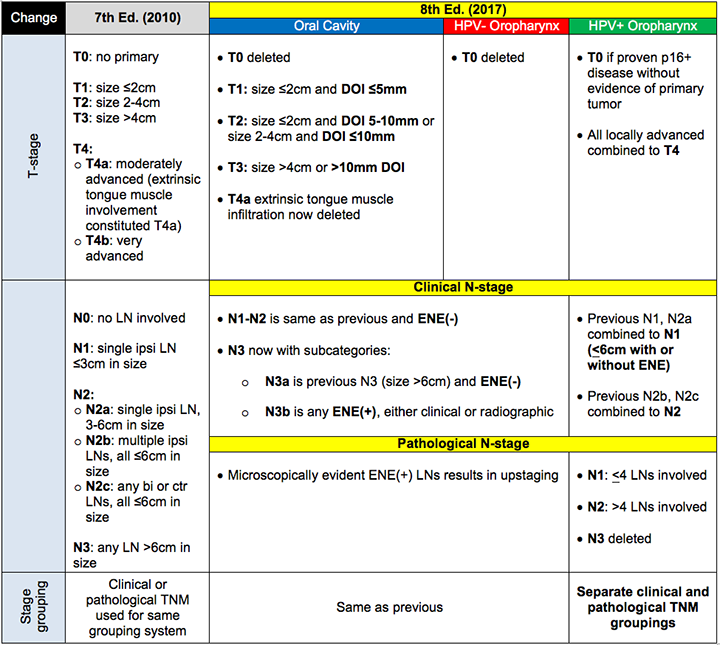 Hubert Low TH, Gao K, Elliott M, Clark JR. Tumor classification for early oral cancer: re-evaluate the current TNM classification. Head Neck 2015; 37:223-228. Kane SV, Gupta M, Kakade AC, A DC. Depth of invasion is the most significant histological predictor of subclinical cervical lymph node metastasis in early squamous carcinomas of the oral cavity. Eur J Surg Oncol 2006; 32:795-803.